We are proud of the transportation program and service offered to Kettering’s older population. The center provides this service with sedans and wheelchair-accessible buses. 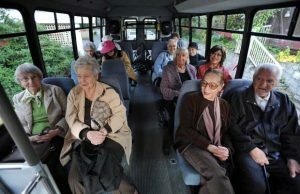 Transportation is provided to medical appointments, grocery shopping, CIL programs, hair salons, banks and pharmacies. General information follows. Please call the center for the complete guidelines for the CIL Transportation Program, 296-2480. How can I volunteer as a driver? We are looking for volunteer drivers to transport seniors to personal appointments. A valid Ohio driver’s license and background check are required. Additional training will be provided by the City of Kettering. The City of Kettering will provide the vehicle. Volunteering requires one morning or afternoon a week. Shifts are four hours long, scheduled between 8 am and 4:30 pm. Volunteer drivers will also be responsible for completing mileage forms. Volunteers report to the Charles I. Lathrem Senior Center. For more information, contact the Volunteer Office at 296-2433. You must be ready at least 1/2 hour before your scheduled pick up time. The driver may arrive 1/2 hour before or 15 minutes after your scheduled time, based upon his schedule and your destination. Please watch for the driver to arrive then exit your home after he pulls to a stop. Our buses will stop at the curb and not enter your drive. Our cars will pull into the drive. The driver will assist you into and out of the vehicle. Each passenger is required to have his/her safety belt securely fastened before the vehicle will be permitted to begin movement. The driver will wait five minutes for you to exit your home. If he does not see you, he will attempt to phone you. If the driver does not see you exit your home within 5 minutes of his arrival and receives no answer on the phone, you will be considered a no-show and he will leave. The driver has to stay on schedule for other riders. For a return ride from your destination, please call 296-2483, to have the driver pick you up. If you are not picked up within 20 minutes of calling for a ride home, please call again to be sure the driver has gotten the call and is on his way. How do I make an appointment for a ride? First-time users need to fill out a transportation card. Call (937) 296-2483 for your transportation appointment Monday through Friday, 8:00 am to Noon. Reservations may be made two-weeks prior to a trip and up until noon the business day before your appointment is needed if space is available. Same day reservations are not accepted. Your name, date ride is needed, time you need to be at your destination, whether you are in a wheelchair and whether an assistant will be with you. You will need the first and last name of your doctor or the name of the business you are going, the street number and street name and the phone number of the office or business. You must be registered for the program, paid Transportation Fee and have purchased a Rider’s Card before making an appointment. Appointments can be made up to two weeks in advance and up until noon the business day before your appointment is needed if space is available. A 48-hour advance registration is required except in an emergency (such as emergency dental, etc.). Appointments can be taken up to two weeks in advance, although there are some exceptions for medical appointments. How do I pay for each trip? Riders of the Transportation Service must purchase a “Rider’s Card” in any of the following denominations of $2, $10, $20, $40. Cards are punched for each round trip, according to the type of trip or length of destination traveled. The number of rides per card will vary according to the amount purchased and distance traveled. Riders must hand a Rider’s Card to the driver at the beginning of each trip. The driver will deduct the amount of the ride from the card. Drivers will not accept payment other than a Rider’s Card. Unused cards do not expire, but you will need to purchase a new card if your card is lost. Cards are non-transferable to other patrons. A Rider’s Card may be purchased at the Charles I. Lathrem Senior Center, or by mail. If purchasing by mail, make check payable to the “City of Kettering.” Checks should be mailed to the Charles I. Lathrem Senior Center, 2900 Glengarry Drive, Kettering, Ohio 45420. You may also call the center at (937)296-2483 with your Visa, MasterCard or Discover number and we will mail your Rider’s Card at no extra charge. First time users need to fill out a registration card and pay an annual Transportation Fee. Riders must also purchase a “Riders Card” before making an appointment. The registration card includes basic information, emergency contact name, and demographic questions. One free trip can be provided into the center to register for the transportation program. After filling out a registration card, please call at least one week ahead of your first appointment. Where can I go and when? We provide door-to-door service to appointments, shopping and visiting. Local Trips are provided within the 1 1/2 mile radius of Kettering. Such trips are for medical, grocery, banks, pharmacies, church or synagogue, other appointments, hair salons, senior center or recreational facility. Such trips are only for medical appointments, trips to the Social Security office, Job Center, hospitals, county courthouse and legal aid appointments. Individuals must be age 60 or older and Kettering residents. All riders must be able to board the vehicle unassisted or provide an aide to accompany them. Wheelchair accessible vehicles are for common wheelchairs. Drivers will assist riders on and off the wheelchair lift and tie down the wheelchairs.